The rounded bowl tapers towards a very thick, straight narrow foot and slightly turns in at the rim; the base is deeply recessed and somewhat pointed. 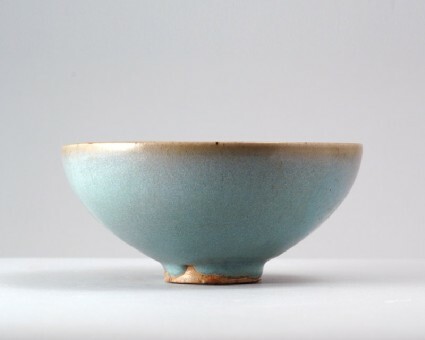 The thick walls are covered with a foamy, milky-blue glaze, which is opaque, but turns translucent and almost colourless at the rim, where it is thin. The base is glazed, the glaze ending inside and outside the foot in an uneven line. The biscuit is of yellowish-buff tone.